Let me start off with that this article is in no way investment advice and you should do your own research and decide if you wish to invest in Bitcoin or Crypto Coins. I have invested, and this article is my opinion. I am pretty sure by now you have heard of Bitcoin and all the surrounding hype, but you might not really know the purpose of Bitcoin and what, if any value it has in our current society. I will try to give you a bit of back ground of how bitcoin came to be, why it came into being, give my opinion on whether you should add it to your investment portfolio for the future and give a site where you can start to accumulate Bitcoin and other Crypto Coins for free. Bitcoin falls into a category called Crypto Currencies. It is an open source software product and is the first decentralized peer to peer payment network that is powered by its users with no centralized authority or middleman. What does all this mean? There has been a lot of media reporting on how our current financial system seems to be rigged and that the everyday person feels that they are getting ripped off by the governments and wealthy institutions running these World systems that are in place. A general feeling of mistrust is evident around the World with protest at World leader summits and even on social media with people voicing their disapproval of how the system is not working fairly for the common folk. The way that Bitcoin and other Crypto Currencies have been set up, is that by not having an authority or middleman in place, the value and price of Bitcoin is determined by its users and not by any governments or institutions. Started in 2008 by Satoshi Nakamoto whom is regarded as a mystery person. Satoshi Nakamoto seems to be a made up name by the developer of an original paper explaining the Bitcoin protocol in a Cryptography Mailing List in November 2008. You can see the original papers here on the bitcoin.org website. The identity of Satoshi Nakamoto is regarded as a mystery man/person. Nobody has been able to properly identify the person and the last time anyone heard for this person was in spring 2011 and when he informed publicly that he had moved onto other things. See Wikipedia for some ideas on whom the mystery person could be. Regardless of who Satoshi Nakamoto is/was, many people say that it is not important as he/her and the team that developed the open source software wants the World to focus on the technology and protocol and what the Bitcoin technology can produce for our society. 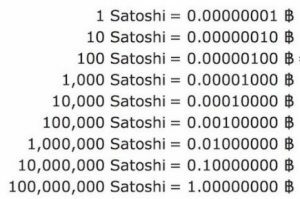 Bitcoins are measured in Satoshi fractions so if you have 1 Bitcoin you will have 100,000,000 amount of Satoshi. (see chart) You are able to accumulate Satoshi’s that are fractions of Bitcoins. Just like Dollars and Cents. By having such a large fractioning, it is relatively cheap to enter into the Bitcoin industry. Satoshi fraction is given from the name of the developer, Satoshi Nakamoto. Now you know where the name Satoshi’s came from. The first historic BTC (Bitcoin) transaction took place when Satoshi sent BTC to Hal Finney. Lazio Henyecz made the first real-world transaction by buying 2 Pizzas in Jacksonville Florida for 10,000 BTC. Yes, that’s right so many BTC at that time as BTC was not even on anyone’s radar. 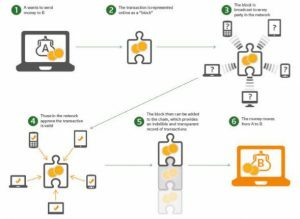 From that time on more and more people have tuned into and accepted the concept of peer to peer transaction payments without government intervention, which a large amount of people have embraced this concept, as they believe that governments and financial institutions are manipulating and controlling our lives through the current systems in place. We just don’t like it! By using the open sourced software cryptography that controls the creation and transfer on money, the bitcoin system is described as a zero trust consensus network which enables a new payment system and a completely digital currency. But…unlike the Worlds current fiat currencies, which can be printed and added to our financial system by governments and financial institutions like the Federal Reserve, Bitcoins are produced/created by the many computers around the world owned by users that task them on solving mathematical problems/captchas, ensuring that only a predetermined amount of coins enter circulation every day. The newly created coins are rewarded to the first person that solves the mathematical puzzle. 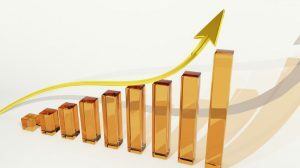 As BTC has become more widely accepted, the price has continued to climb as the simple concept of supply and demand drives the price to new heights on a regular basis. Unlike the current fiat system, where currency is continually added to our system, Bitcoin has a limited supply and once they are all released there will never be anymore add into circulation. There will only be just under 21 million BTC released. Actual figure is 20,999,999.9769 BTC, because of some kind of calculation. So in theory this means that BTC should go up in value, but to be honest, no one really knows what can happen in the future. There isn’t anyone I know that has a crystal ball and can tell me where the price of BTC can end up, or any other instrumentality for that matter. The potential value of BTC can really be anything. Some people in the media are calling that the price for one Bitcoin could reach as high as $1,000,000… Yes that’s right $1,000,000. Some are saying it could reach there even before that time. Others are saying that we are already in a bubble and the price (as I write this the price just hit a new high of $5500 for one BTC) could come tumbling down like the famous Tulip crash in 1636-37(Wikipedia) where a frenzied demand pushed prices to astronomical levels and then came crashing down wiping out many people’s finances. Block Chain technology is what is driving the interest from investment and digital gurus that can see a future Block Chain technology system adopted in many different parts of our society and financial society. The Block Chain Technology is a digital ledger that is continuously growing and is made up of blocks which serve as a growing list of records. Through encryption, record-keeping remains legitimate. With Block Chain, transactions and spending based on the amount of crypto currency you have being kept with utmost accuracy. The Block Chain is permanent and once a transaction is recorded into a block, then it stays there forever. This makes it difficult to actually commit fraud. Users can always refer to the Block Chain to keep track of every transaction they make. There are many well-known speakers reporting on the Block Chain Technology and how it works and you can see some on Ted Talk. A well respected media program. Some explanations about Block Chain Technology can be found on these Ted Talk programs. Two famous personalities and business men, Richard Branson and Bill Gates, have commented on Bitcoin and also implementing BTC as a payment acceptance into their multinational companies. Most people know of these gentlemen and when they speak about certain topics, people stop and take notice. Mark Cuban, another billionaire, who was a great skeptic and actually called that Bitcoin was in a bubble, changed his tune and tweeted out “might have to buy some” and has just been reported to have backed a new $20 million crypto currency venture investment fund. Now these are just a few well-known people that are commenting on the Bitcoin industry and as the days go by more and more are entering the Bitcoin and Crypto currency arena, as they can not only see the investment benefits but also learning about the technological benefits within our future societal industries. OK…where can we spend these Bitcoins? 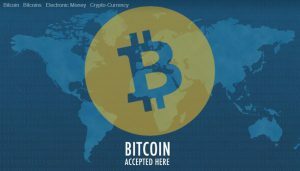 With the acceptance and understanding that Bitcoin is gathering, more and more merchants are willing to accept Bitcoins as payment for services and goods. These merchant range from well know organisations, and over a large range of industries. Some include: Microsoft, Virgin, Apple, Bing, Dell, Expedia, Home Depot, Kmart, Target, Victoria’s Secret, Sears, CVS Pharmacy, Amazon just to name a few. The list continues to grow each day as businesses recognise the benefits of Bitcoin and by allowing Bitcoin payments, they are increasing their customer base. What about Bitcoin as an investment? As any investment product, there must be caution and diligence as to deciding if Bitcoin is the right product for an individual. There are always risks involved in any investment form, but below are closing prices in USD, taken from the end of each year from 2010 to my current writing of this article. Then you can make your own mind up on BTC investment capabilities. Now these are from the end of each year but you can search yourself to see the price movement throughout each year. You can see that the price dropped between 2013 and 2015, but after that, as the public and media caught on about the Bitcoin industry the price climbed quite quickly. The price reached just under $5000 in the month of August 2017 and then retraced during September and perhaps ready to re-coil for its next jump upwards. 2017 has been a stellar year for Bitcoin investors and holders and created many wealthy participants. I’ve added my opinion first before I explain on how you can start to get into Bitcoins further below. I myself am a late starter on the Bitcoin phenomenon and started accumulating Bitcoin just recently. I was advised many years ago to just go ahead and put some small money into Bitcoins but just kept putting it off and I am kicking myself now. You might think that we are all too late to join the benefits and that it might be too late to jump on the band wagon, but the more and more I delve into the crypto currency industry I find myself being drawn into the question of “what if” and “what could happen” with the price and technology. Now as mentioned above, there will only ever be 21 million Bitcoins created so it is impossible for every person in the world to have one Bitcoin each, and if the price continues to track it’s past it is likely to continue to climb. Whether, it reaches $1 million is anyone’s guess. Apart from just the supply and demand aspect of the coin, the technology is gaining traction and companies are researching on how to implement it into their business profile. An exercise for you, try to search “how many people actually own Bitcoin?” You will be very surprised at the number….There is plenty of room to grow! How can we make a start? There are a few ways to get into the Crypto Currency industry and I will explain briefly and what my recommendations are. Open an Online Coin Wallet. This is a must as this is where you can store your coins and keep them. There are many Coin Wallets to choose from, and as I have found out, not all countries allow Bitcoins to be used in their country. Australia (where I am from) has very strict financial policy regulations (which I think is a good thing) and tries to ensure that people and investors are protected as best as possible. The opening of an online wallet requires certain verification and they are all basically the same with each company. The wallets that I will be recommending are reputable companies that have been around for a while and where you can buy, sell, receive, send and store safely. These are the wallets that I use and have my coins stored. For purchases and selling of your coins you can link your bank account with ease and you are able to trade coins as well. Just like Coin Spot you will need to go through a verification process to confirm that you are a bonafide person, uploading required information to set your account up. There is no need to panic as Coin Base is one of the biggest Bitcoin wallet companies and has been in business since 2012. They are well know and regarded as the big boys on the block. There are other coin wallet companies but these are the two that I am with and use to send bitcoins to and from and also purchase my Bitcoins when it is my time to add to my investments. 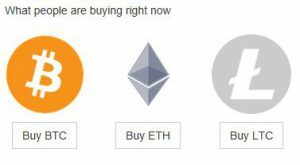 They don’t only have Bitcoins but other crypto coins and I investment in Bitcoin, Ethereum and Litecoin at the moment. How else can you get Bitcoins or other coins? One process that is used to create Bitcoins is called the process of mining. Now mining takes place by using your computer and browsing certain websites that have a problem to solve and after you solve the problem you are rewarded with a payment of Satoshi’s or Bitcoins. The mining can take place by simply filling in a “Solve Catpcha Code” and the owner will pay you. The owner buys Bitcoins, produces a website with advertising and they make money by people clicking on ads or by buying products from their website. Mining is not as profitable as the past, as with the price increase of Bitcoin it has made mining not necessarily a worthwhile exercise. There are mining pools where groups of people pool together their PC power and mine as a group and then split the rewards and also you can purchase mining software that is used to mine on your behalf. People that understand mining have a formula calculation for determining on how fast your computer has to be, how much electricity you need to use to make a determination if it is at all worthwhile. I started solving captchas many years ago with my laptop, and the time it took to get a very small amount of Satoshi’s I stopped and gave up. I still sent my earned Satoshi’s to my Coin Base wallet and I remember I sent something like 4cents worth but with the price increase of Bitcoin they ended up being worth 68 cents. Not a bad return when you think of it but just imagine if I had started with 1 Bitcoin. It would be worth over $5000 now. There is another place where you can start to accumulate Bitcoins and other coins for free. Yes FREE…You start by simply opening an account and they give you coins every day. You don’t have to give any personal information at the start. 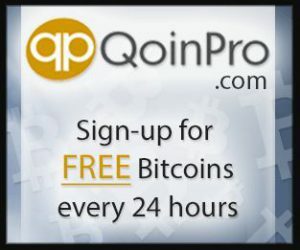 The company is QoinPro https://qoinpro.com and they state that they are giving away coins to build their user base. You can read more on their Mission and Vision Statements once you sign up for free. I have signed up and have been receiving my free coins each day but still do not have enough to make a withdrawal transfer to my other coin wallets just yet. I guess time will tell if they are genuine or not. The company has been operating since 2014 and they are registered in Hong Kong. I take the view that it’s all for free and from searching the internet they are a legitimate company and not scammers. I also just add to my account with small regular investments and buy the dips when I can and over time I hope the price will continue to increase and my wealth will grow with it. So all in all my final conclusion is that I think if possible, everybody should at least try to get themselves some Bitcoin, even just put a few dollars aside into a possible instrumentality that could have some action on the Worlds next financial system. Or at least be involved in what might be part of a new payment transfer system. I am of the belief that it is never too late to start but only with funds that you are prepared to lose in case it all goes pair shape. I am not a financial adviser or investment guru but just sharing my opinion and thoughts on the Bitcoin and Crypto Coin Industry to my understanding. Make your own informed decision and just do your research and get educated on our future digital transaction space. Thanks for taking the time to read my article and feel free to leave a comment or thoughts and share among’st people you know so they too can learn a bit about Bitcoins. It is interesting to me that I came upon your website purely by chance directly after signing up with Coinbase . I bought some bitcoins for the first time and am a real newbie in this area. I got more pertinent information from your one website than I did surfing the web for bitcoin information. Hi and thank you for reading my article. Yes the Bitcoin space is still quite daunting to people so I hope when my readers understand my information they can make an informed decision on whether they should invest. Thanks and glad you found my article helpful. I am very glad I came across your post about Bitcoin. I always wanted to know what Bitcoin exactly is and your post gives a great explanation. Bitcoin was always a mystery to me. To be honest, because I did not understand the concept and in my mind, it sounded Scammy, I always avoided the topic. It makes a lot more sense to me now and I will definitely take your advice and do a bit of research. I am always on the lookout for investment opportunities. Thank you very much for an excellent post! Just 1 question. Should I decide to invest in bitcoin, what is the minimum investment you would recommend to get started? Hi Rika, Thanks for visiting my site and my article. Yes there is a lot of scepticism on bitcoin and crypto currencies and yes there are a lot of scammers that take advantage of unsuspecting consumers. Educating yourself is a must when it comes to any form of investment and searching reviews and testimonials are a great way to start. With all riskier investments, you should start with what you think your losing tolerance is and what will not effect you badly if the investment doesn’t work. The beauty with BTC you can start with as little as $5 and then work yourself up from there. As the price grows so will your investment. I must say that I am not a financial adviser so seek professional advise. HI John, You need to see how I was reading your post eagerly, I have seen a lot of adverts about Bitcoin but did not know much about it. In fact I thought it was connected to Forex Trading but with this new information , I know better. If a guy like Bill Gates have approved the Bitcoin, then I think , it is the way forward. One more thing, I will like to know when you finally withdraw yours, how much more you earned. Thanks for the information. Hi Stella and thanks for taking the time to read my article. Yes the Crypto Currency and Bitcoin industry is still not well know or understood believe it or not. People have heard of it but still are confused about the industry. The technology connected to these coins is the most exciting part for our future and the big financial guys are starting to take note. There are a few links where everyday people can start to earn BTC for free and I just want people to research and not be afraid of the industry. Be careful yes but not afraid. My earning unfortunately is quite low but I have personal friends that have made $100,000s out of the BTC just these past 10 months. They did tell me to get some but I was a bit sceptical myself at that time. Never mind, It;’s not too late but I just buy the price dips and search for these sites that give free BTC and build up my holdings that way. Thanks and I hope you get some for the future. No one really knows where the price can end up.